Seldom do I stumble upon an individual who inspires me to work hard in my areas of interest; Irish and technology. Then again, seldom do I meet someone like Teresa Lynn. Purely by chance, I met Teresa whilst on an internship in the ADAPT Centre in DCU last summer. Teresa, a former student of Sacred Heart School, Drogheda, and graduate of DCU, recently completed her PhD in Computational Linguistics. 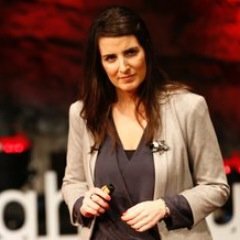 She worked in the areas of technology, project management, machine translation and language technology after receiving her undergraduate degree in in Applied Computational Linguistics in DCU in 2002. As a “returned-Gaelgeoir”, she has a great interest in Irish, consistently putting great emphasis on the language within her work. Her PhD included the development of the Irish Dependency Treebank and the first statistical parser for Irish text. What prompted me to write about her was my recent viewing of the recording of her TEDxTalk. The talk itself took place in February, where Lynn detailed the manner in which “social media breathes life into minority languages.” In particular she highlighted the Irish language as she described the research she did on the use of Irish on Twitter while on a Fulbright Scholarship to St. Louis University in the US. This aided the decision I had to make in relation to the topic of my undergraduate thesis, which will not be half as interesting or engaging as Teresa’s presentation. Teresa has also demonstrated that working with the Irish language is not limited only to those who are native speakers. There are areas of language technology that only require specific skills in a language – in this case Teresa applied her knowledge of syntax and grammar to developing a tool that can analyse the linguistic structure of an Irish sentence. Like many Irish people, Teresa did not use her language after Leaving Cert until she moved to Australia in 2007. In Melbourne she joined the Cumann Gaeilge na hAstráile which enabled her to build up her confidence in spoken Irish in a relaxed, non-pressured environment. It was after this return to the linguistic community she decided to apply her technology skills to the preservation of the language and pursue her PhD – which was jointly awarded by Macquarie University in Sydney and Dublin City University. Teresa is also the co-founder of the Celtic Language Technology Workshop – an academic forum where researchers on language technology for Celtic languages can meet, collaborate and share knowledge. She also collaborates with the wider community of international researchers in minority and less-resourced languages. Teresa is a true inspiration, working hard to keep a minority language alive through technology and the development of new ideas. She really is someone to look up to, and her achievements can surely be viewed as aspirations.